Here they are, that young couple who married at Kullie Chaha in Indian Territory on March 9, 1899. Now they have five children. My Grandpa Verb Sharp is standing directly behind his mother, Vernie. Standing behind his dad is Vassar Newt Sharp. Vas was the second born. In front sitting at her dad's feet is Mirl Sharp and next to her is her sister Ev. Her name was EVA but we always called her Aunt Ev. The boy between his parents is Oscar Vansler. We all knew him as Uncle Bawley. At this time they would be living in LaFleur County around Poteau somewhere. Oscar (Bawley) was born in 1911. Aunt Ev was born in 1910. Carroll SHARP aged 21 and Vernie POOLE, aged 18 both of Kully Chaha in the Indian Territory were married on 9 March 1899. This marked the beginning of the Poole/Sharp connection in my family. The following year marked the turn of the century and this young couple appear in the 1900 Federal Census in the Choctaw Nation, Indian Territory, Township 8, North Range 27 East on 20 June 1900. He states that he is 21 and she states that she is 20. Funny, she was 18 just last Spring when they married. They have no children yet. Verb will be born in March of 1901 and he was their first child. She could actually be pregnant with him at this time and not even be aware of it yet. Verb and Nancy Sharp are still in Oklahoma at Census time in 1940. They are living at WALL, in Stephens County and they own their farm and state that it is worth about $500. Verb says that he went to school until 8th grade. He was 38 in 1940 and Grandma Nancy is 46. Genola is still home and is 18 years old. Oss is 16, Mirt is 14, Verbie is 10, and Bobby is 8 years old. They will be selling the farm and heading West soon. Birthplace: Oklahoma * He was actually born around Poteau, Oklahoma when it was still Indian Territory. In the 1920 Census, Verb is still living at home and is 19 years old. The family is in Poteau, Oklahoma. His father is listed as Carl but we of course know his name was Carroll. Grandpa is listed as Virba. Vas is 16 and listed as Vassar N, Myrle L is 12, Ev is listed as Ervie A and is 9 and Bawley is listed as Oscar V and is 8 years old. In the year 1930 I find my Grandparents, Verb and Nancy Sharp living in the Southwest corner of Oklahoma. Stephens County, Wall Township. Genola is 8, Ossalee is 6, Mirlacoys is 4 and Verbie Jr. is 1 yr. This census was taken on April 13th of 1930. Their last child, Bobby, will be born April 3, 1931. Grandma Nancy states that she is 35 and Grandpa Verb is 29. They are Farmers and they own their land. 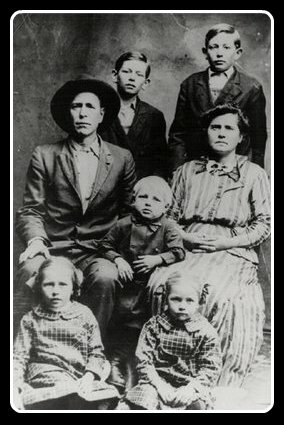 In 1940, they are still in Stephens County, in April 1940 and the census taker caught them there. Verb says he is 38 and owns his farm and states it is worth $500. He says he went to school until 8th grade. Nancy is 46. Genola is 18, Ossalee is 16, Mirlacoys is 14, Verbie Jr. is 10 and Bobby Ray is 8. 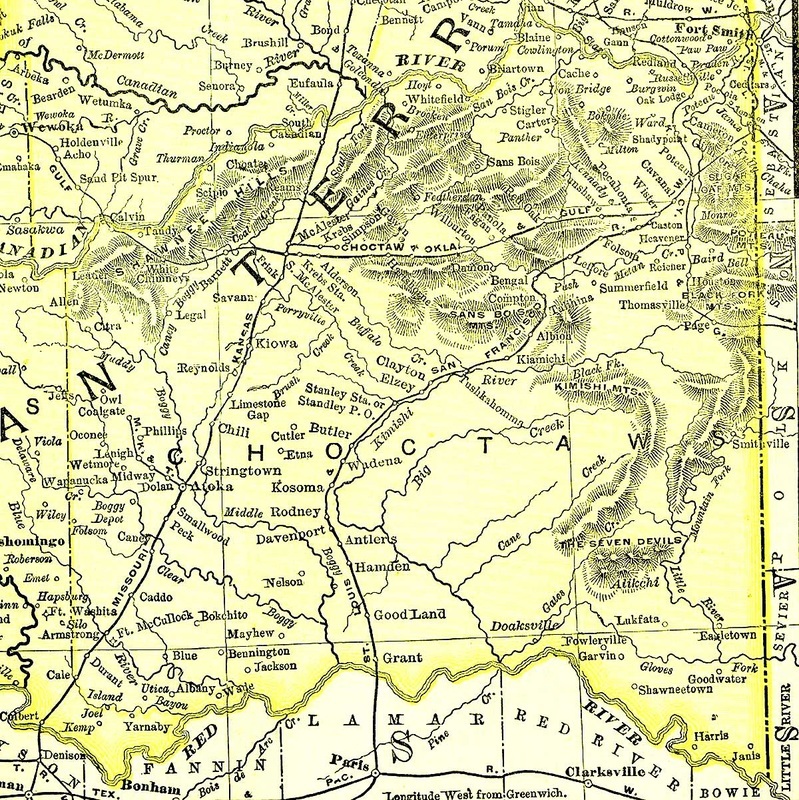 In the 1830's most of the civilized tribes of the southeast (Cherokee, Creek, Choctaw, Chickasaw and Seminole) were forced to move from the southeast to West of the Mississippi River. Most of them wanted to stay in their homeland in the South. In 1830 President Andrew Jackson passed the Indian Removal Act. In 1838 the Cherokee, the last to leave, were forced from their cabins in North Alabama at bayonet point and moved to Oklahoma. Many thousands were moved along the Tennessee River and over three thousand were marched through Alabama on land. This dark chapter in our history is called the TRAIL OF TEARS. There were some 17,000 Cherokee Indians that started on the Trail of Tears and over 4,000 died; a fourth of the Cherokee population. In the Waterloo, Alabama area where my Sharp ancestors lived, they arrived in pitiful condition and were moved by steamboat to West of the Mississippi. Over 300 of them escaped and many of their descendents still live in Alabama. I learned recently that some of my Sharp ancestors bought their land in this area for a little over 12 cents per acre. The land of course was TAKEN from the Indians and then sold to the new settlers this cheaply. This would be my great great grandfather (Carroll's father). I wish I could learn how much money a Confederate widow collected. Would be interesting to know. Looks like she drew on it from 1901 to her death in 1916. The best guess I can make is that by the time of her death, she probably could have drawn $75 to $100 per month. Our first ancestor in America that can be documented is William Sharpe, he first came to Virginia in 1611, probably as a military man to help protect the colonies. His wife Elizabeth and two sons came to America in 1620 on the HMS Bonaventure, along with a servant, Richard Vause. Our ancestor, John Sharp is the first that we can find many documents proving connection to our family, although there seems to be some dispute as to his birth year. He stated his family said he was born in the year of Braddock's defeat which would be 1755. It was also stated that his marriage was January 1, 1766 in Buckingham County Virginia which would have made him 10 or 11 years old so one of the dates is wrong. Charley Sharp was born about 1830, just about the time the last of the Indians were removed from Alabama. He was born in Lauderdale County, AL. He was the son of Adron Sharp and Martha Lamb (who were married January 26, 1828 in Lauderdale County, AL). Charly's father, Adron came to Lauderdale County, Al in 1820 with HIS parents Charles and Matilda "Anglin". They married August 20, 1807 in Patrick County, Virginia. Adron was born in Patrick County on August 21, 1810 and was the second oldest of eleven children born to Charles and Matilda Sharp. Charles was born on Christmas Day 1777 and Matilda "Anglin" Sharp who was the daughter of Adron and Elizabeth Anglin was born May7, 1788 in Virginia. There is very strong evidence that Charles father was John Sharp who fought at York Town and Guilford County Courthouse, Virginia during the Revolution. John was born in 1735 in Chesterfield County, Virginia (date is not certain) and moved to Buckingham County where he married Frances on Jan 1, 1755. He was living in Bedford County, Virginia when he joined in the was effort on April 3, 1781 and was in Patrick County when he applied for a pension on November 13, 1832. John Sharp passed away in the last mentioned county May 29, 1834. Now back to Charley Sharp.....He came to Green County Arkansas sometime in the early 1860's and enlisted in Company D, 5th Arkansas Infantry at Little Rock on March 15, 1863 to serve for a period of one year or more. His wife, Matilda Boles Sharp being left alone in Greene County, AR, while her husband was away at war....took her infant daughter, Mary Ann Sharp, and WALKED all the way back to Lauderdale County, Alabama to be with her parents, Mr. and Mrs. Gustavous Aldophus Boles. Mary Ann, the oldest daughter of Charley and Matilda Sharp was married at Mixon, Logan County, Arkansas to James McConnell on Feb. 21, 1878 and they had Matilda, who died at a young age, Charlie McConnell, and Adron, Ester, Ezra, Jesse and mattie who died in her teens. The other children of Charlie and Matilda were Clarisa who married J.M. house in Booneville, Oct 23, 1884, Adron Sharp who married Matilda Voyles, Nov. 30, 1888 and lived between Booneville and Mixon raising a goodly number of Sharps, Pugh Cannon Sharp who married Ivy Jarvis, July 31, 1901 in Greenwood, Arkansas, Martha "Mattie" who married Spncer "Charlies" Weddle, June 14, 1888 and moved to the Oklahoma Territory, Ellar Louise who married Bill Ward, Sept. 7, 1890 in Booneville, William Sharp who married Node Pool and moved to Poteau, Oklahoma and Carroll Sharp who married Verna Pool, March 9, 1889 and moved his family to Woodlake, California. All these children of Charley and Matilda had their own children and many of which have gone on to other parts of our country to start new family lines. There were OTHER Charlie Sharp's. The Sharp ancestors just about wore that name out. Dan Wood, a cousin, from the Sharp/Wood lines, sent me a big manilla envelope full of wonderful treasures. Amoung the pages I found the Confederate soldier, Charles Sharp. He was a private in Company D of the 9th Alabama Regiment. The first time I find him, he is sick in the Chimborazo Hospital, No. 4 in Richmond, Virginia. His illness is simply listed as FEVER. He was admitted on November 23, 1861 and he returned to duty on December 26, 1861. My heart just aches when I think of him leaving the day after Christmas. Then I find him again in the C.S.A. General Hospital in Danville, Virginia on May 6, 1862. I can't make out what his illness is. It looks like Nue Selopexiceum. He returns to duty on September 19, 1862. THEN...I find him once more on a Receipt Roll for clothing on April 30, 1863 and finally I find him KILLED at the Battle of Salem Church on May 3, 1863. I guess he did not get to use those clothes. Just a simple "casualty" list of the 9th Reg of Alabama Volunteers in the Battle of Salem Church, VA.....Remarks: KILLED. And Charly is gone. His grandparents would have been Charles and Matilda Sharp. He would have been our Adron Sharp's nephew. 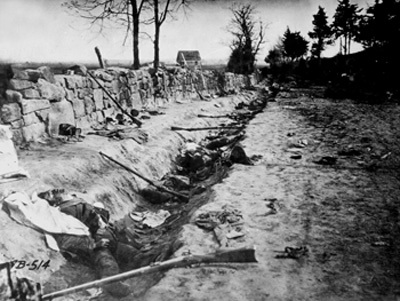 Actual picture of Confederate casualities at the Battle of Salem Church, VA. Our Charly could be one of them.